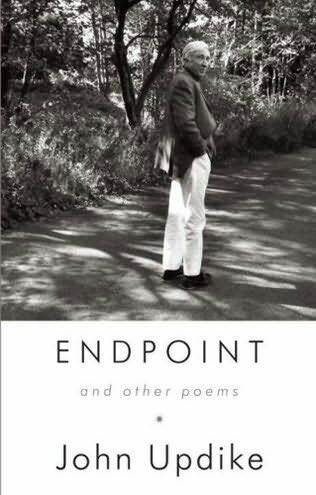 Reading John Updike’s final book, a collection of poems, is like receiving a dispatch from the afterlife. The poems take us nearly up to the point of his death from lung cancer in January this year. He sent the manuscript off and then he died. The cover photo has a poignancy to it, with its spontaneous, snapshot quality, the sombre ordinariness of it in its black and whiteness, and the sense that John is about to head off down a path we can’t follow him down, not yet. intended to preserve the thing consumed. His final reflections are baldly honest. His poetry is less ornate than his prose, and it makes him seem more vulnerable, frail. He has let me in on the final secret journey he took, which I only learned he had taken when his death was announced that hot, hot January day. After the ‘Endpoint’ sequence, are pages and pages of other poems, as if to say John is not really dead, as if to say he’s still alive like he should be, like I thought he would be.